X-Ray Security Screening System Market size was estimated at over USD 2 billion in 2016 and is projected to grow at over 5% CAGR from 2017 to 2024. Increasing security concerns due to an increase in terroristic and illegal activities across the world is a prime factor driving the x-ray security screening system market during the forecast timeframe. The presence of security electronic systems at prime, high-risk locations such as airports and shopping areas can reduce the occurrences of such instances. Additionally, the movement of illegal contraband such as weaponry, drugs, and humans across state and international borders is aiding in the market growth. The increasing government focus on enforcing safety and security protocols is projecting the growth of the market. The governments around the globe are launching plans for the modernization of out-dated equipment and the construction of new transit locations. For instance, the construction of the Beijing Daxing Airport is currently underway and is expected to serve over 100 million travellers annually. Such a location poses massive potential for the occurrence of terrorist activities and will require the need of advanced technologies displaced at prime points such as passport and baggage controls entry-ways. The applications in the industry has high advantages over traditional security processes as they can aid in eliminating the inconvenience and inefficiency of manual, body-cavity and baggage searches and streamline the traveller screening process. The high initial costs associated with replacing existing systems, primarily full-body and vehicle scanners, is challenging the growth of the x-ray security screening system market. However, the benefits of utilizing these systems outweigh the cost drawbacks in the long-term. Additionally, the equipment also possesses a radiation risk for the occurrence of tissue damage and may pose a threat to the industry. Rising occurrences of terroristic activities, with a high emphasis on countries amidst political and religious turmoil, is promoting the growth of the x-ray security screening system market. This is attributed to the rise in government initiatives to protect the general population by installing theses equipment in high-risk locations. For instance, in March 2016, a suicide bombing attack in Istanbul, Turkey led to over 4 deaths and 36 causalities. The prevention of such instances is a major concern amongst government agencies as these can also lead to heavy losses by damaging the infrastructure and reducing the trust of the people on the government. Transit locations such as air and sea ports and other locations encountering heavy movement of goods are ideal locations for the terrorist attacks and smuggling activities. The presence of such security equipment, such as baggage and millimetre scanners, can detect even trace amount of contrabands situated inside large baggage containers and is driving the market. 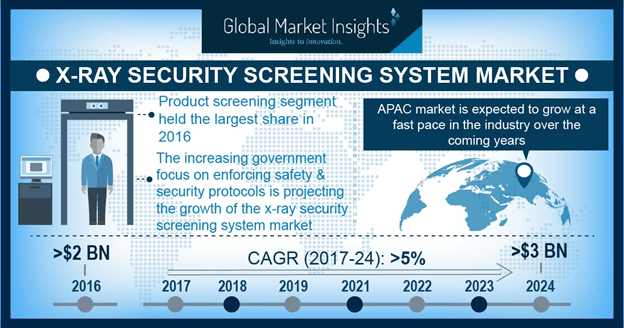 The trends in the x-ray security screening system market indicates that product screening holds the largest share in 2016 and experiencing high industry growth. This is largely attributed to the rising occurrences of drug and weaponry movement over the borders. These systems can aid in the scanning of large product volumes such as vehicles and shipment containers. The people screening segment of the market is expected to experience reduced adoption owing to issues pertaining to privacy of the individuals and the occurrence of radiation poisoning among susceptible clients. Additionally, these systems can only detect metal and other contraband outside the body. 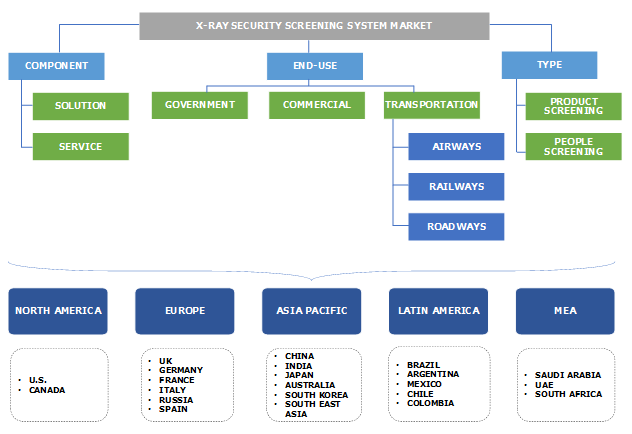 Large scale industrialisation and the growth of the e-commerce sector, facilitating the movement of goods to and from the Asia Pacific region is a key factor promoting the x-ray security screening system market. Additionally, various government bodies in the regions have launched regulations mandating the usage of these systems for the protection of human life and financial property. For instance, the Chinese government has mandated the provision of digital flat panel detector (FPD) x-ray systems in the Tier-2 rural hospitals. Increasing demand for cargo inspection systems is due to the increase in export and import of goods will offer impetus for the industry growth over the forecast timeline. Government focus on the safeguarding of offshore ports from dirty bombs and the increase in traveller traffic at high-risk transit locations such as airports is contributing to the high growth of the market during the forecast timespan. Additionally, the Transportation Security Administration (TSA) has also announced that it is working in collaboration with American airlines for the installation of new security lanes to reduce the inconvenience, invasiveness, and the time taken for the completing a complete body and baggage check. Vendors operating in the market includes MinXray, Inc., Adani Systems Inc., L-3 Communications Security & Detection Systems, Smiths Detection, Astrophysics Inc., Kapri Corp, Autoclear LLC, OSI Systems, Inc., Scanna MSC, Westminster International Ltd., and Vanderlande. Companies are required to undertake business strategies such as product launches, marketing activities, and mergers and acquisitions to sustain growth. The x-ray security screening system market is highly competitive owing to the presence of a large number of players holding very small market shares. A prominent strategy amongst vendors is to invest in R&D activities for launching of new and advanced systems. For instance, in November 2017, Scanna MSC announced the launch of its portable panels which improves the task of the operators and minimizes the clearance time for suspect packages. X-ray security screening system market have high applications within the government and commercial sector for the detection of metal, drugs, weaponry, and other contraband on a person’s body or within a package. These systems are ideal in high-risk, public locations such as airports and hotels that encounter large amounts of travellers on a daily basis and are highly susceptible to illegal activities. Occurrences of suicide bombings and public shootouts can lead to widespread panic, loss of financial property, injuries and deaths. The government is the largest user of the x-ray security screening system industry. For instance, in June 2017, L-3 Communications Holdings announced that it was awarded a multi-year contract from the U.S Army for the supply of these systems.